Every B2B marketer has the same struggle – to capture more leads. One way to generate more leads for your business is to use web forms. Since 2012, SuperOffice has rolled out several web forms for sales, marketing and product development, capturing the contact information for more than 110,000 business leads. Get inspiration from 5 practical examples of how we use web forms on our site. Plus, we share form optimization tips based on an analysis of 350,000 form visitors (and what makes them convert!). It’s no secret that B2B marketers struggle with lead generation. In fact, as marketers, it’s our biggest challenge. Every year, we list our top challenges and generating leads tops the list. Time and time again. Yepp, you guessed it – generate leads. Now, the most practical way to generate leads is from your website. You can do this by either publishing your contact information online and hope that the website visitor will call or email your team, or you can use a web form. Web forms lead the way when it comes to lead capture tools. In fact, 74% of marketers use web forms for lead generation. With 49% of marketers stating that web forms are their highest converting lead generation tool. The more people you can convert, the faster you will reach your website goals. Every website should have at least one goal. For B2B marketers, it’s usually a “contact us” type goal, in which they attempt to turn an anonymous website visitor into a business lead. So, one goal = one web form, right? Sure, you can keep web forms to a minimum, but the advantage of having multiple web forms on your website allows you to gauge the quality of a lead. For example, a lead that signs up for a free trial is closer to buying than someone who requests pricing information. Setting up several web forms allows you to automate “behind the scenes” processes, so you can escalate “ready to buy” leads to a sales rep or add to your existing follow up lead list. 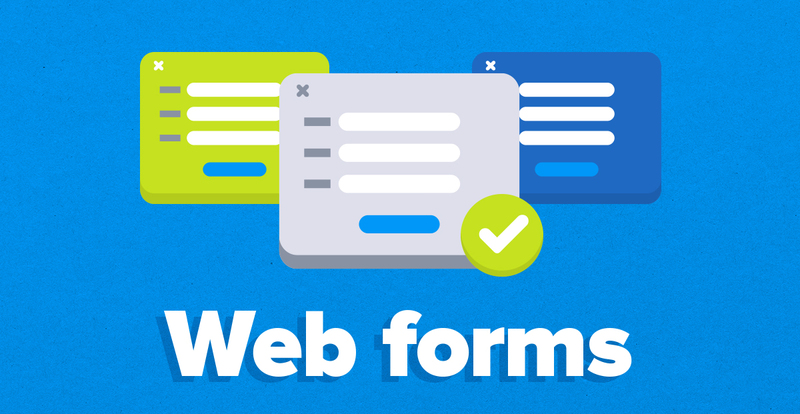 But, other than a simple contact form, what else can you use web forms for? 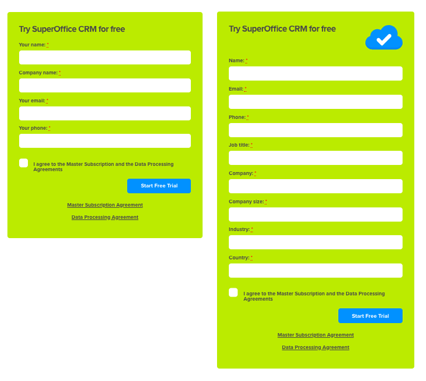 To inspire you to capture more leads from your website, I’m going to show you how we use forms on the SuperOffice website. I’m going to share 5 practical web form examples that are live on our website right now, including 4 of our best converting lead generation web forms. But, first… I’ll explain what we mean by a business lead. A lead is a person or business that expresses interest into purchasing products or services at your company. Opt-in. An opt-in is someone that provides you with their information in order to receive email marketing communication from you. Typically, an opt-in is added to your mailing list, newsletter or advertising campaigns. If consent is not given, then it is considered spam and you cannot send marketing emails. Otherwise, you risk being fined by GDPR. Marketing lead ((Marketing Qualified Lead or MQL). A marketing lead is someone who has shared their contact information with you and is deemed more likely to become a customer compared to an opt-in. A marketing lead is qualified based on web pages they have visited, content they have downloaded and similar engagement metrics that display an interest in your product or service. Sales lead (Sales Qualified Lead or SQL). A sales lead is someone that has shown an interest in your product or service and has been researched and assed by a sales person, and is considered ready to move on to the next stage on the sales process. The most common way to capture a business lead is through a web form. Web forms have played an important part in our lead generation strategy at SuperOffice. Our first web form, a “contact” form was launched in 2012. To date, our “contact” form has helped us generate thousands of leads. At any given time, there are more than 20 web forms live on our site – always ready to capture contact information from a potential B2B buyer. In fact, this is the reason why we generate so many leads. Since 2012, and dozens of web forms later, our web forms have helped us generate more than 100,000 leads! Best of all, the number of leads continues to grow – which results in new customers, higher revenues and greater profits. All of which wouldn’t have been possible without web forms. So, it’s fair to say we have a lot of knowledge to share when it comes to web forms and generating leads. So, what kind of web forms does SuperOffice use? Without web forms, it’s difficult to capture contact information from a lead. Here, I’ll show you how we use forms for free trial, events, gated content and ad campaigns. I’ll also include examples of how we use web forms to engage with our customers. The most important form on your website should be the form that holds the most value. In most cases, it will be related to a product or service. In our case, our most valuable lead is someone who signs up for a free trial. The free trial form itself is linked to the home page. 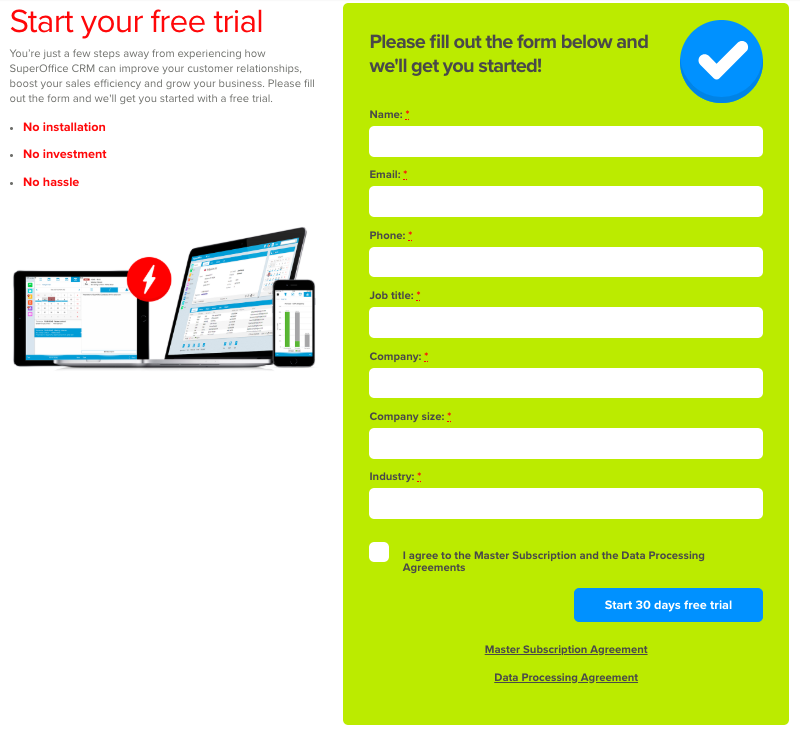 Right above the fold, a free trial call to action is prominently placed for potential customers to find the form easily. Once clicked, they arrive at this form. As you can see, we try to make it as easy as possible for visitors to sign up – only asking for their name, company, email and phone number. Since launching our free trial program in 2015, more than 12,000 buyers have signed up for a free trial. That’s a lot of ready-to-buy leads that we’re generating from this form! We also have similar forms for our full suite of CRM products on sales, marketing and service. All forms are linked to product and pricing pages – making it easy to sign up to the products they’re interested in. Prospect events. Customer events. Partner events. You name it! Last year alone, we hosted more than 200 events on topics ranging from GDPR, technology, social selling, marketing, and of course, our own product, SuperOffice CRM. In total, we had over 10,000 attendees! One reason we host so many events is because we know they work. In terms of top lead generation channels, live events rank second (just behind email marketing). They’re also second in terms of channel ROI ratings. It comes as no surprise then that if you want to sign up for a SuperOffice event, you have to fill out a web form. Here’s an example of a web form for a recent live digital event we hosted at our UK office. As this was a digital event hosted across several days, we also included a drop-down menu for attendees to choose the date that suits them best. One thing we’ve been doing lately is mixing social with event marketing by streaming live webinars on YouTube. Each time someone signs up using the form, we send them the URL to our YouTube streaming page, which they can access when the event begins. These events have been met with great success and continue to be sold out – weeks in advance! Blog posts, product pages and case studies. In B2B marketing, content is a proven lead-generator. But, do you know which content drives the most leads for your businesses? Earlier this year, DemandWave surveyed B2B marketers and asked them which type of content generated the most leads on their websites. The answer? White papers! In fact, 1 in 2 B2B marketers use white papers to generate leads. At SuperOffice, we too use white papers. A lot! Our very first white paper was launched in 2012. It wasn’t revolutionary by any means, but it was a good piece of content on the topic of customer service and, to this day, it still generates leads for us. We’ve since launched more than 20 white papers and guides, covering GDPR, sales, marketing, customer service and CRM. To date, our white papers have helped us generate more than 70,000 leads! Are you using white papers as one of your lead generation techniques? If not, it might be time to start. Publishing a white paper doesn’t need to be a complex and time-consuming project. For example, you could easily turn product brochure sheets into PDF documents or take a series of blog posts on a similar topic and turn into a downloadable guide. Either way, just make sure you hide the content behind a web form, so you’re able to capture contact information. Similar to our free trial form, we ask for the same information – name, company, email and phone (asking for phone number is a recent addition). 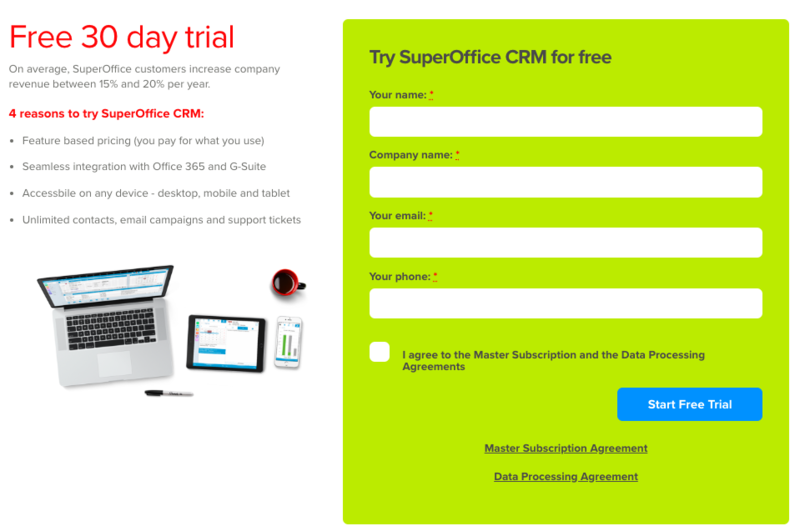 The main difference here is that rather than list the benefits of using SuperOffice, we explain upfront what the reader will learn from downloading the form. 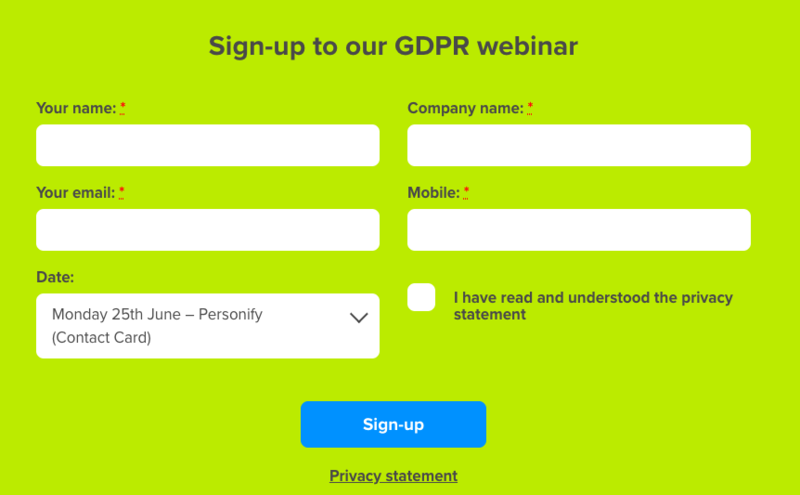 We’ve also changed the legal spiel underneath the form from subscription and data processing agreements to a standard “privacy statement” link. If you want to compete in 2018, you need a healthy marketing budget. And when it comes to digital marketing, the biggest part of that budget will be spent on pay-per-click (PPC) campaigns. 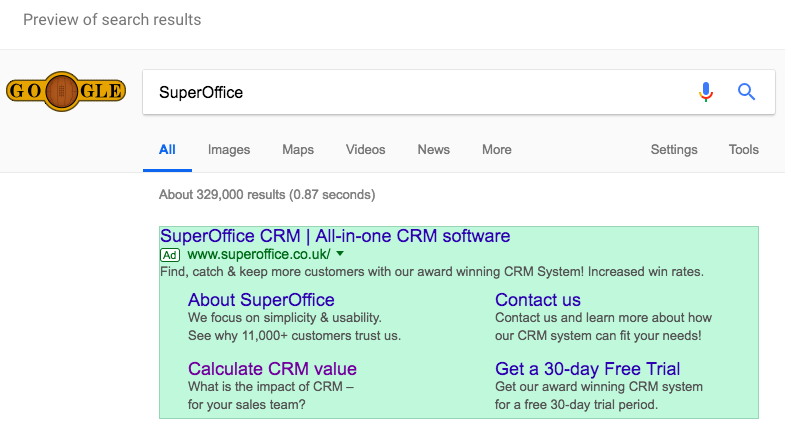 For us, this means creating Google Ads to appear in their search results pages, so when a B2B buyer searches for a specific word or phrase (i.e. SuperOffice), our branded ads appear. Each ad directs the buyer to a page on your website. Most of the time, you will send buyers to your best performing (in terms of leads) web page, but ideally, you will create a unique page for visitors that arrive after clicking your ads (also known as a landing page). For our ad campaigns, we have created specific pages based on the word or phrase they search for and each of the landing pages have another type of form to help us capture contact information. The first thing you will notice here is the form’s length. This form is longer and includes 3 more fields than our regular free trial form. As we’re paying for clicks to this page, we want to make sure that the quality (aka – seriousness) of people who fill out the form are worthy of our investment. If we pay €5 per ad click (it sounds expensive, doesn’t it? ), and we capture mickeymouse@gmail.com or donaldduck@aol.com email addresses, then we’re wasting our spend. By making the forms longer, we test a visitor’s seriousness, as it requires more of a commitment. If they are serious about CRM, then 3 additional fields will not prevent them from completing the form. A €5 cost to acquire a serious B2B lead doesn’t seem that expensive now, does it? It’s no secret – here at SuperOffice, we ❤️ our customers. For many of our customers, our sales reps, customer experience reps and CRM consultants are an extension of their own teams. It’s the way we do business, and it is tied to our company’s DNA and our “CRM and a smile” culture. We value what our customers say and, so, we want to hear from them. In fact, we encourage it – which is why we use web forms to capture product feedback. Of course, not all feedback requests will lead to product suggestions or service improvements. You will hear from unhappy customers and you will receive complaints. But, at least you will hear from them! Only 1 in 25 unhappy customers will complain directly to you. 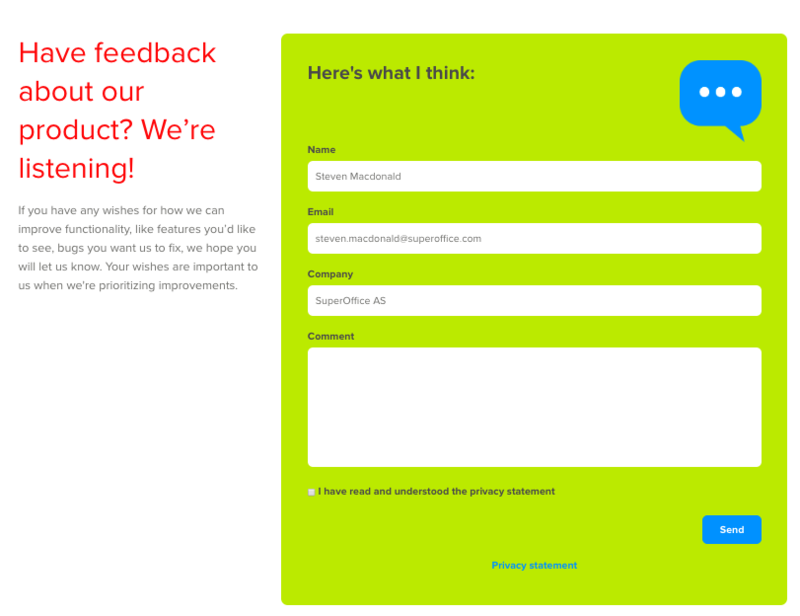 So, by adding product feedback forms, you are giving them a platform to share their experience with you (instead of with their network on social media!). From a business perspective, the benefits of customer feedback play an important role in business growth. Companies that collect and act on customer feedback generate a 10x greater year-over-year increase in annual revenue. It also plays an important role in developing our product and services. And the best kind of feedback you can ask for is from paying customers that use it, every day. Now, this is the only form on the list that you cannot find while browsing the website – you have to be a customer (who knows what kind of feature requests we would receive from Mickey Mouse)! This web form can be found once you’re logged into SuperOffice CRM – simply click the “Help” menu at the top of the screen and then scroll down to ”Feedback”. It’s that easy. The difference between a good company and a great company is the quality of customer service. When we analyzed 1,000 companies to see how they respond to customer support requests, 62% failed to respond. We also found that 91% of companies do not use web forms to capture customer service requests. In other words – the majority of companies don’t use web forms and the majority of companies fail to respond to customer service requests. Each time you create a web form, you need to create a rule. Where does the lead contact information go? Who, in particular, should it go to? By answering these questions, you create your first rule. In the case of a customer support form, creating a web form for customer support tickets only means it goes directly to our customer support queue – not a general inbox or to a completely different department where the email ends up in a black whole. Here’s how our customer support form looks. Clearly, this is a big change from the rest of the forms we use, and not just in term of web form design. 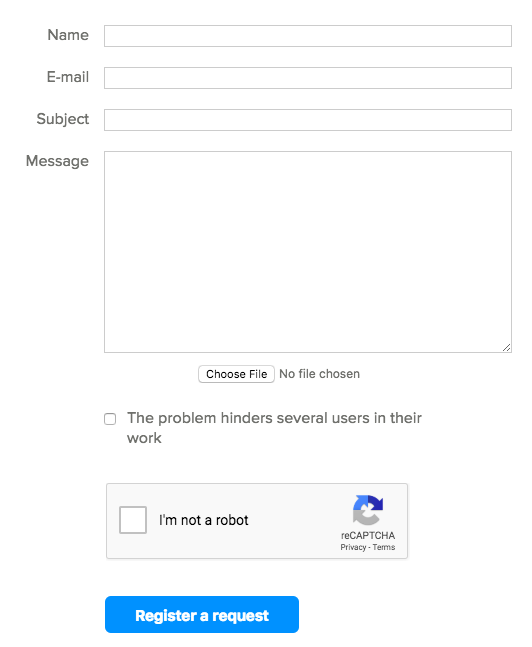 Aside from the color and our only use of Captcha, the support form allows for attachments, which is important if customers come across an error message and want to support their message with a visual – helping our tech support teams understand the issue quickly. Another noticeable difference is the checkbox “The problem hinders several users and their work”. If a customer checks this box, then the importance of the request becomes a high priority. It is then routed to a senior customer service supervisor who will act upon it quickly. Lastly, and not shown in the screenshot above, there’s an option for customers to login and submit their requests, saving them time spent adding their name and email address as part of the request. Anther benefit of allowing customers to sign in and submit their request is that our customer service reps can access their full contact card, installation type, product usage and experience with SuperOffice CRM, which should produce a better, more personalized customer experience. Based on implementing 200 web forms, attracting 350,000 visitors and converting 100,000 business leads, we’ve identified 3 key web form best practices to help you generate more leads, including form length, form integrations and lead response time. The story goes that the more fields you include on a web form, the fewer the number of people that will complete it. This story is based on a study of more than 40,000 web forms published in 2010 that revealed that if you cut down the number of fields on your form from 4 to 3, the number of people that fill out your form will increase by 20%. 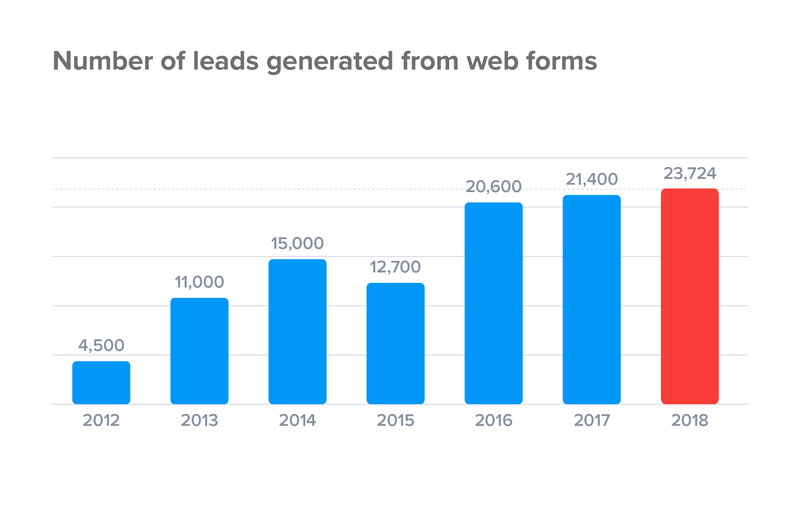 Now, given our biggest challenge is generating leads, B2B marketers jumped at this chance of improving form completion rates and reduced all web form fields from 4 to 3. But, as always, what works for one marketer doesn’t necessarily mean it will work for another. So, we decided to test form length ourselves. One test in particular included twice as many fields (8 in total). 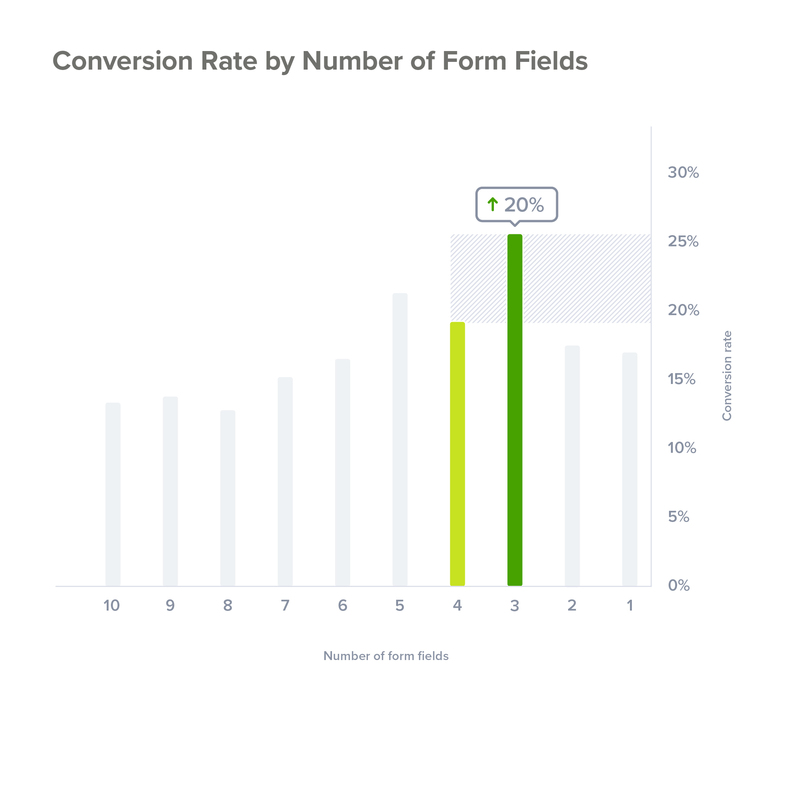 Surprise, surprise – we found that the more fields you include, the more leads you generate! That’s right – our longer web form increased the number of leads by 50%! People who filled out the longer form were “ready to buy” leads. According to our sales reps, these leads were more engaged when we called, much more open to discussing their CRM needs and they were more committed to CRM as a philosophy within their organization. If you only have 3 fields on your web forms, now might be the time to think about adding one or two more fields to see how well they perform compared to your existing web forms. By doing so, you could end up generating twice as many leads! The most successful B2B marketing teams have a formal lead handling process. Surprisingly, 46% of all lead data is stored in Google docs. That requires a lot of copying and pasting! A lead fills out their contact information and submits the form. The lead contact form data is saved in your CMS. A marketing assistant will copy the data into a Google docs spreadsheet. A marketing assistant will then copy and paste the details into a CRM system. Marketing department then informs sales about the new lead by email. Sales rep marks time in calendar to contact a new lead. Sales rep calls the lead and invites them to a demo or a free trial. Now, it might be a sales rep that does the part of marketing or maybe it’s someone else. But, for the most part, it’s usually the same standard process. The problem is that it’s not an optimal process. Contact information could be copied incorrectly or sales teams might be busy, and the lead goes cold. You’re losing business by manually handling leads. If you’re looking for a more efficient lead handling process, then consider integrating forms with your CRM. Integrated web forms take your contact data and push that data straight into your CRM system. No more middle person copying and pasting the data. Instead, integrated web forms make that process completely seamless, saving you time, resources and preventing you from manual errors. Perhaps the biggest benefit to integrated web forms is speed. 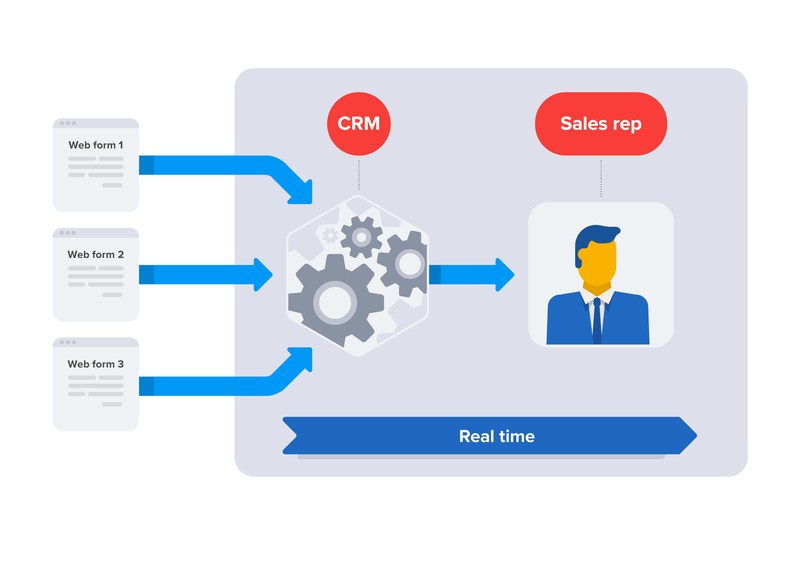 By setting up workflows, you can notify sales reps each time a new lead is registered so they can prioritize and follow up on newly registered leads – all in real time. Contact data is sent directly into CRM system. Automatic notifications sent to first available sales rep. Sales reps reach out to the lead and invite to a demo or free trial. So, if you want to save time and resources and, become more efficient in the way you handle new business leads, try integrated web forms. SuperOffice rolled out our web forms feature at the end of last year and our customers have been quick to implement it on their own websites, given the numerous benefits it provides. To date, we’ve helped our customers automate more than 10,000 web form submissions directly into their CRM – freeing up hundreds of working hours. You have the best converting web form on the planet. Your lead data is automatically sent into a CRM system and a sales rep is notified of a new lead. But, he is busy. He doesn’t call. The lead goes cold. The sale is lost. If you don’t follow up on your leads, no amount of web form recommendations can help you. Unfortunately, this is happening far too often and it’s killing the growth of many B2B companies. Earlier this year, we analyzed the lead response times from 1,000 companies to find that the average lead response time is 12 hours and 10 minutes. If a lead fills out a form on your website, but doesn’t receive a reply, you lose their trust. All of the trust you built up on your website – the marketing copy, the awards and customer logos, the social proofing – is all lost. Worse still, he (or she) will forget all about your company and, instead, will become a customer of your biggest competitor. And when someone asks him (or her) about your company? And just like that, you’ve lost two customers. Or more. The foundation to a successful lead generation process is connected to a lead handling process and lead follow up process. One cannot succeed without the other and a weak link ruins the entire program. Although it’s the third and final web form best practice tip, it’s arguably the most important one. Get your lead response times right and you’ll acquire new customers. Get it wrong and won’t win any new business. Generating new leads is a B2B marketer’s biggest challenge. And for the foreseeable future, it’s not going to change. One way to increase the number of leads you generate is to add more forms on your website. At SuperOffice, web forms play a crucial role in how we acquire leads. We’ve used web forms to collect free trial sign-ups, for event marketing, gated content and our ad campaigns – all of which have helped us generate over 100,000 business leads! But, the way you use web forms doesn’t have to stop there. We’ve continued to improve our web forms by testing their length and reviewing our lead generation processes – both back-end processes in how we follow up and in ways to automate how contact information is stored. All of these improvements allow our sales reps to get immediate notifications on every new business lead and follow up quickly, in real time, before the lead goes cold, giving us a much greater opportunity to turn every new registered lead into a happy and long-lasting customer. As a B2B marketer, what’s your biggest lead generation challenge? Leave a comment below and I’ll do my best to help you get more leads. P.S. If you enjoyed reading this article, please share it on Twitter here! Once you have generated a lead, your next step is to communicate with them. The best way to do this is through email marketing. 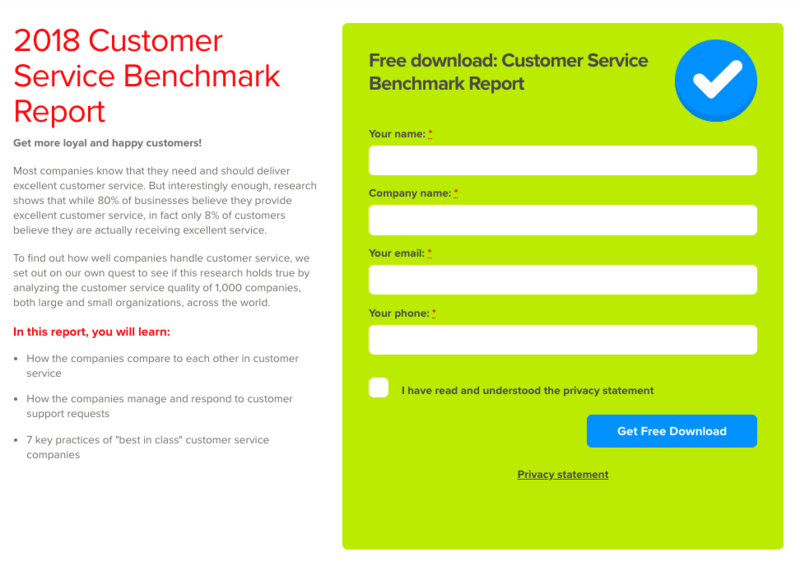 Download our free email marketing benchmark report below to understand how B2B marketers are using email to turn passive opt-ins into sales-ready leads. Hey Steven, can this be used in promotional products industry? We are looking for ways to improve our sales. Absolutely, David! Give web forms a try and then let me know how it goes! David, hope your exploration has been successful? We have several Customers in the UK who operate in this sector and one is Total ID whom you can see a great case study in our Customer section. Please feel free to contact us on info@superoffice.co.uk in order to arrange a free demo if you wish. Remarkable post! I love the web form examples you provided, especially the customer support form. Great idea to include a log in function to make it easy to identify who the customer is! Great post! It was good that you included some web form examples too. Thank you!